TfL are sitting on fifty three million pounds of our money? What are they doing with it all? Certainly not making this bloody Tube carriage any less crowded, that’s for sure. That’s about the cost of a Zones 1–6 Travelcard isn’t it?! TfL? Transport for London? Train’s full and Late, more like. I could make dad jokes like this all day about bloody City Hall bureaucrats. TfL said 19,790,130 cards which have not been used for a year or more represent a value of £52,914,424. Hang on. 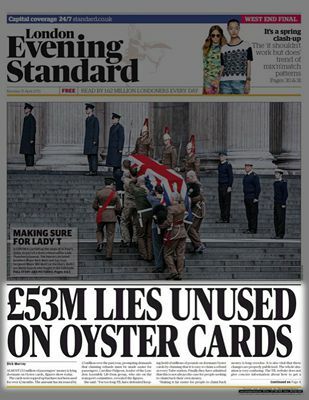 £50m on twenty million Oyster cards is only just over £2.50 each. Er. I’m less angry now. Good job that context-setting statistic is prominently displ…oh. It’s actually on this well-hidden news satire blog I just clicked through to. If the world isn’t my oyster, it’s not because of crippling credit card debt from the unspent e-shrapnel on the five forgotten Oyster cards loitering around my home. It’s because everything makes me so mad! Especially big numbers in headlines! Rargh!